I recently had to help a client with encrypting a file before uploading that file to an FTP. Thanks to the PGP task in Task Factory we were able to fulfill this requirement in a matter of minutes. In this example I will walk you through quickly creating public and private keys and then using those keys to encrypt the file. From the SSIS Toolbox drag and drop the PGP Task into the control flow and then open it for editing. For “What action will this perform?” choose Encrypt File. Click Generate Key to create your own public and private keys. Note: Public keys are used for encryption and private keys are used for decryption. Now to fill out some basic information. The private key created will require a password, please remember to store this password somewhere safe, i.e. some kind of password vault. This will be required to decrypt files. 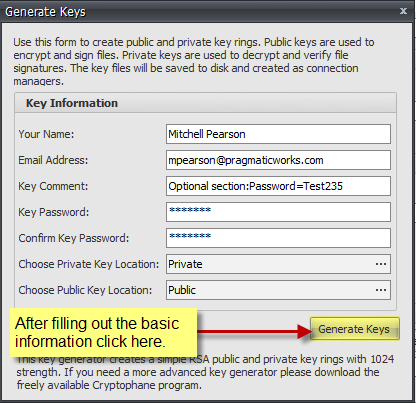 Now that we have generated PGP keys we can now encrypt our files in just a couple steps. A screenshot of all steps below is listed at the bottom. Select “strFileName_Encrypt” for the variable. Select connection manager: Select “Public”. Note: The connection manager “Public” was added to the package automatically when we generated new keys. Public is the name I gave to my public key ring. Finally select the Public Key you wish to use for encryption. We only have one key on our key ring. I have provided three screenshots below. As always thanks for looking and your feedback is appreciated!